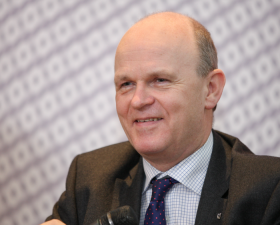 AvtoVAZ CEO Maure expects some growth in Russia next year. MOSCOW -- AvtoVAZ, the Russian automaker controlled by Renault and Nissan, will not return to profit until at least 2018, CEO Nicolas Maure has told a Russian business daily. Maure was brought in to turn around the company in March after its sales plunged and his predecessor, Bo Andersson, came under fire from shareholders. "My main aim now is to return the company to profit. It will take some time, no earlier than 2018," Maure said in an interview with Vedomosti. "A lot will depend on the market conditions. Shareholders are not asking for a concrete timeline." Russia's biggest carmaker has been hurt by the country's deepening recession, fueled by lower oil prices and Western sanctions over Moscow's intervention in Ukraine. Sales of its market-leading Lada brand fell 31 percent in 2015, sending the company to a net loss of 73.85 billion rubles ($999.3 million), almost triple its 2014 loss. In the first five months, Lada sales slipped 11 percent, according to figures published last week by the AEB Automobile Manufacturers Committee. Maure said he planned to increase export sales and consolidate AvtoVAZ's domestic position, which he hoped would show small growth in 2017. "Car sales have fallen but Russia still has a significant population - more than 140 million people," he said. "With time the market will recover, and AvtoVAZ and Lada will claim a significant share." The Renault-Nissan Alliance has a majority stake in Alliance Rostec Auto, the holding company that controls AvtoVAZ. Renault-Nissan CEO Carlos Ghosn will step down as chairman of Alliance Rostec Auto at AvtoVAZ's annual meeting on June 23. He will be replaced by Sergey Chemezov, Rostec’s CEO.